Before we can go into the question of how Saint John the Baptist administered Baptism, we must understand what the word Baptism means. The simple answer is that the word baptize does not mean “immerse”! Those who maintain that the Greek verb bapto means “to dip or immerse” are generally correct. (For example, the term is used in the Old Testament, as it is in classical Greek, for dipping hyssop or a finger in the blood used for sacrifice, or dipping one's feet in the Jordan River. However, our word baptize translates the Greek word baptizo, not bapto. While bapto may mean “to dip or immerse,” baptizo does not refer to a mode, but to a process and an effect. Biblical baptisms focus on both purification (either actual or ceremonial) and identification. Most people are probably unaware of the fact that there were baptisms in the Old Testament. Hebrews 9:10 speaks of “various baptisms” (translated “various washings”) that were part of the Old Testament economy. The writer of Hebrews refers to three of these ceremonial baptisms in verses 13, 19, and 21. In each verse (together with their Old Testament references), there is a clear picture of the process and the effect that constituted an Old Testament baptism. In verse 13, the writer speaks of a baptism in which “blood of goats and of oxen, and the ashes of an heifer being sprinkled, sanctify such as are defiled, to the cleansing of the flesh:” This refers to Numbers 19:17-18. Here a clean person takes hyssop, dips it in a vessel filled with water and the ashes of a heifer that has been used as a sacrifice, and then sprinkles it on those persons or things that are to be cleansed ceremonially. In Hebrews 9:19, we read that Moses “took the blood of calves and goats, with water, and scarlet wool and hyssop, and sprinkled both the book itself and all the people,” This refers to Exodus 24:6-8, where again we see that the process of an Old Testament baptism was to dip the hyssop and wool into the blood and sprinkle it as a means of ceremonial purification. Finally, in Hebrews 9:21, there is a description of a process by which Moses “sprinkled with blood both the tabernacle and all the vessels of the ministry.” Leviticus 8:19 and 16:14,16 provide the background for this Old Testament baptism. The priest was to dip his finger in the blood of a bull used for sacrifice, and then sprinkle the blood on the mercy seat (representing atonement). This was a ceremonial means of removing the uncleanness of the children of Israel. In every case the process of baptism included a dipping of the instrument used to baptize into a substance such as blood or water. The instrument was then used to sprinkle the person(s) or thing(s) to be baptized. This process had the effect of identifying the substance used for the baptism with that which was baptized. As a result, the people were regarded as ceremonially cleansed by that substance. The baptism was not the dipping, but the process of dipping and sprinkling according to God's order. The emphasis of these Old Testament baptisms was not on the mode of baptism, but on the effect: cleansing or purification. These baptisms did not represent something that people did, but something that God did in providing a cleansing from sin and guilt. Baptisms were his means of ceremonially providing such purification. Well the New Testament builds on the Old, and I believe that it is important that we define our terms biblically. Hebrews 9, and the fuller Old Testament passages to which it refers, clearly describes baptisms. When New Testament baptisms are introduced, they are linked with these Old Testament baptisms. For example, the debate between John's disciples and the Jews in John 3:22-26 focuses on “purification”. New Testament baptisms, like the Old Testament ones, were understood as purification rites. The process of baptizing would certainly be the same in the New Testament baptisms as in the Old Testament baptisms, except, of course, that the only element used in New Testament baptisms was water. 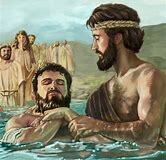 In New Testament baptisms, then, the process of applying water to someone identifies the person baptized with the cleansing properties of the water. The emphasis is not on dipping or immersing nor is the emphasis on sprinkling or pouring, but on the process of identifying the one baptized with a cleansing provided by God himself. Now that we have explained the meaning of the English word baptism and its Greek counter part baptizo, let me explain why I believe that Johns baptism was by immersion. In John 3:23 we read, “John also was baptizing in Ennon near Salim; because there was much water there.” Why was John baptizing near Salim? "Because there was much water there." Pouring or sprinkling does not require “much water.” But if John was baptizing by immersion, he would have needed a lot of water. In Mark 1:5 we read, "And there went out to him all the country of Judea, and all they of Jerusalem, and were baptized by him in the river of Jordan," Why was John baptizing IN the Jordan River? Could it be because he was baptizing by immersion? You do not need to get into the water to pour or sprinkle water on someone! I think we will stop there and continue next week on the subject of Jesus's baptism and why He was baptized.